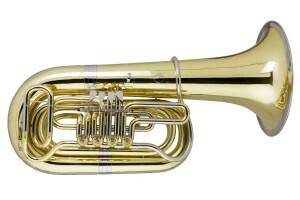 The baritone is made of roughly the same length of tubing as the trombone, but it is designed in the shape of a small tuba. 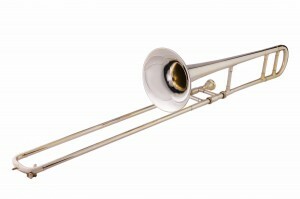 As a result, it has the same range as a trombone but a somewhat mellower sound, and uses valves rather than a handslide. The tuba is the largest member of the brass family, and has a deep, dark, powerful tone. It requires more air than any of the other brasses, and its massive tone is the foundation of the symphonic band sound. 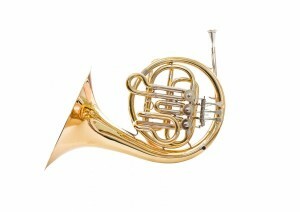 The French horn produces a warm, rich sound and is capable of a very wide range of notes and tone colors. It can blend equally well with other brasses or with woodwinds in ensemble playing, and can be sensitive or stirring as the music requires. The mouthpiece for the horn is small in diameter like that of a trumpet, but is funnel-shaped rather than cup-shaped in order to produce a more mellow sound. The horn is probably the most difficult of the brasses for a beginner, so ordinarily a student interested in horn will start on trumpet. The trombone is the only member of the brass family which makes use of a handslide rather than valves to change the length of the instrument. It has much the same tone quality as a trumpet, but its sound is even more full and broad. The trombone is an important member of both symphonic (band or orchestra) and jazz ensembles, and its medium-sized mouthpiece is an advantage for most beginners as well. The trumpet has a very familiar sound long associated with ceremony, from weddings and military funerals to inaugurations and coronations. It is perhaps the most versatile of all the winds, and can be heard in music of a great many other styles as well. As with the rest of the brass family, the sound is produced by buzzing one’s lips into the mouthpiece. The characteristic tone of a trumpet is full and focused, and can project strongly through even the largest of ensembles.